HAJI MOHD. MOHSIN inherited vast expanse of land and was a renowned zamindar. By a deed dated 20.04.1806 he created a trust (now Wakf) of all his lands for social and religious purposes. These lands cover enormous area in prime locations of Calcutta and district of Hooghly (40 Kms from Calcutta). 2. The Properties of the Haji Mohammed Mohsin who was bachelor and he had vast numbers of properties. 3. His half sister Manu Jaan Khanam was the daughter of Aga Mutahar a Zamindar in Bengal with vast Jagir in the time of Aurangzeb. The properties of Aga Mutahar included the Maujas of Khidderpore, Rajarampur, Daulatpur, Sonai and Benodepur and very vast areas in Jessore and Khulna now in Bangladesh. 4. Manu Jaan Khanam died issueless and all her properties devolve on Haji Mohammed Mohsin. 5. That Haji Mohammed Mohsin on his death in 1813 left vast properties including Pargana magura Comprising of Mouza Kidderpore, Sonai, Rajarampur and Benodepur of Touzi No. 92 district 24 Parganas recorded in the General register, part-1 of the Revenue paying lands under section 6 & 8 of Act VII of 1863 was included in the said List of Kharij Twoleat Properties. 6. That due to the indifferent unmindful inattentive attitude of the community and lack of determination, co-ordination, organization and willingness to defend the Properties of the Hooghly Imambara, with the passage of time outsiders have encroached trespassers tried to remove all papers of the properties of the Hooghly Imambara. 7. That at a conservative estimate the values of the properties of the Hooghly Imambara will be not less than Rs. 10000/- crores in landed properties. Apart from landed properties the respectable Haji had dedicated and set apart many religious articles (particularly Panjas used in Alams and taboots). There is a list of these articles which is mind-boggling. These panjas (hands) are made of gold or silver and the weights are also indicated. They are studded with rubies/precious stones. The list is kept in the office of the Bengal Treasury which also has security (??) over these religious ornaments/artefacts. These were, on earlier religious occasions taken out in the Muhassam processions but not in the last 50 years. One wonders if they are actually safely kept and an inventory to re-check is definitely required. The lands so dedicated have been the object of misuse by the various trustees who have only furthered their personal gains. To regain these properties is a mammoth task and involves litigation. 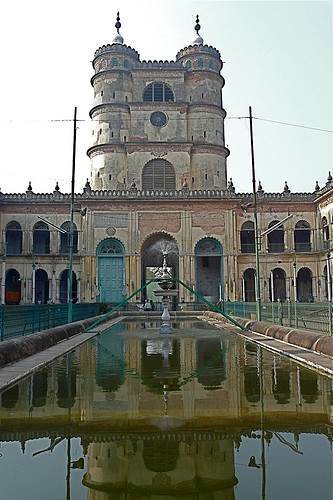 Unfortunately the present management is doing what their predecessors had done and are not protecting the interests of the Imambara Estate or the Welfare of the Shia Community. It is an uphill task and involves a gigantic effort. This is no short term remedy. The philanthrophic Haji also built a school and college. The college bears his name and is an esteemed institution. The first person from India to become a judge in the Privy Council at London (Justice Amir Ali) studied from college (HAJI MOHSIN COLLEGE) and also stayed in the IMAMBARA premises at HOOGHLY. He was a Shia Isnashari and had written many books. A huge fund lies kept with the Govt. of Bengal known as the HAJI MOHSIN ENDOWMENT FUND. The laws of India allow minority communities to set up and run educational institutions for their benefit (50% quota). However not a single Shia has benefitted from this FUND and the Govt. is trying to portray that it is not meant mainly/primarily for Shias. If properly pursued a large number of Shia children can benefit from this huge fund kept with the Govt. of Bengal as also get direct admission into the Haji Mohsin College on the basis of the minority quota.. This is an “ Imam Bargah” - a centre for mourning and sorrow established for commemoration of the supreme sacrifice of IMAM HUSSAIN (A.S.), the son of Imam Ali (A.S.) and Bibi Sayedah Fatima (S.A.S. ), and the grandson of the Holy Prophet Muhammad (be peace upon them), that was made by him on 10th Moharrum 61 A.H.[10 Oct 680 A.D.], at KARBALA in present day Iraq. Late Haji Mohammad Mohsin Isphahani endowed his entire property in the year 1806 from the funds of which the HOOGHLY Imambargah was constructed in the year 1840. Imam Hussain (A.S.) and 72 members of his family and friends sacrificed EVERYTHING they had to uphold truth and justice. The objective was to preserve and protect the pure teachings of Islam as expounded by the Holy Prophet Muhammad (be peace upon him and his Holy Progeny), to awaken the human spirit and protect humanity from indignation and deprivation at the hands of oppressive and corrupt rulers. The epic struggle of this small band before the huge forces assembled by the tyrant ruler Yazid son of Muwaviah involved men and women of all age groups covering all human relationships at IMAM HUSSAIN'S (A.S.) side . 14 centuries later Imam Hussain's (A.S.) sacrifice remains alive in the hearts of millions of his followers [the Shias] and his admirers. Commemoration for his martyrdom continues to this day in different parts of the world by many not limited to Muslims..
Imam Hussain 's (A.S.) life and martyrdom demonstrate a complete role model for all of humanity to emulate converging in his personal excellence in every noble human quality especially knowledge, leadership, patience and total submission to the will of Allah (S.W.T. ).